Simple, bold spiral-bound notebook and coordinating matchbook jotter with your choice of monogram. Printed in letterpress with vintage type on a brown kraft cover. Notebook features a unique half-moon cut-out along spiral-bound edge on front and back covers. Jotter features 20 blank interior pages, each perforated at the bottom for tearing out. Available with red, yellow, blue, black or silver monogram. Set includes one notebook, one jotter. and one pencil. These items are also available individually here (notebook) and here (jotter). These matching items can be printed with uppercase letters only, with a maximum of 1 character (same letter and color for both items). Please read the "About Personalized Items" tab above before checking out. 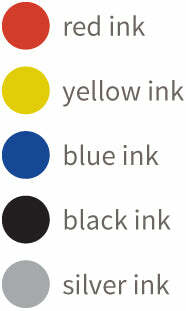 Allow 4 to 5 business days for your personalized order to be handprinted in letterpress. Please note custom-printed items are non-returnable. Sizes: notebook: 6" x 9" x 7/16"; jotter: 2-1/2" x 3-7/8" x 5/16"